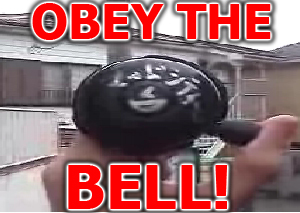 Japanese Bicycle Bells Are The Law! Japan is the land of ramen noodles, soapy handjobs, and bicycles. I think on my last count I noted there were a hojillion bikes in Japan. On each one of them is a bicycle bell. These small, yet extremely powerful tools are the key to dominating Japan. Everyone obeys the bell and is too weakened by its presence to do anything. It is Japanese kryptonite. After having watched this, I don’t think we will ever have to go to war to control Japan. I mean really, they rebounded so much so after WWII that we now bow to them for reliable automacars. But with a legion of bell-weilding soldiers, I think Asia is as good as ours.